Skimmia japonica 'Red Princess' is a dense, dome-shaped, evergreen shrub with dark green, leathery leaves and red buds in winter which open to scented white flowers in spring. 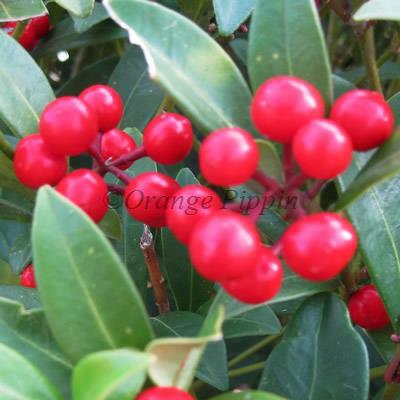 These are followed by large clusters of bright, shiny red berries if planted near a male variety of Skimmia for pollination. This easy to grow, low maintenance shrub is very attractive to bees and is a fine plant for autumn and winter interest. It would be best grown in a full or partially shaded position in the garden, a woodland area would be the perfect spot.